The Farmhouse Cream Painted Country Oak 3 over 4 chests of drawers is hand made my skilled joiners exclusively for Top Furniture. These drawers are manufactured with a sustainable American Oak top and are delivered FULLY ASSEMBLED and ready to use. These chest of drawers are finished beautify with a hard wearing cream painted finish which is sure to a great focal point of any bedroom. This chest of drawers offers great storage space for items of clothing and other household items such as books. 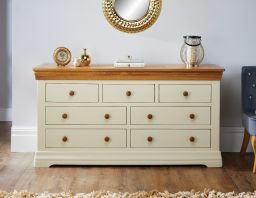 View our matching cream painted chest of drawers here. Lovely sized chest of drawers beautifully made.. Good solid furniture. Very pleased. Very well packaged and as good as the picture says. Looks lovely and seems well made. Unfortunately Internal drawer size very small, so although dimensions bigger than current chest of drawers, can not fit all the clothes in! Very pleased with the furniture, very solid and finished nicely. Should last for years . Very good quality item. Love the look. Overall very good service. Delivery was ok, we hadn't realised that items were delivered to the ground floor only and we bought to go in bedroom so more work involves than we had anticipated. Great looking Chest of Drawers. Whow, what great furniture. I ordered 2 bedside units and a 3 over 4 chest of drawers they were packed very well thus no damage. They look wonderful in my bedroom. I would recommend top furniture to anyone who wants that little bit extra. Thanks to Rob who delivered my goods at 6.15 am - very impressed. I will be buying from you again. Keep up the good work. Exceptional. Good value. Excellent quality. Lovely solid furniture, good quality. I’m really pleased and the delivery was excellent arrived at 7am and delivery slot was 7-9am. Excellent all round. Lovely quality, looks very stylish. Very pleased with chest of drawers. Well made and looks really good in my lounge. Would recommend. Delivery was quick and efficient and arrived at the time I was told. Beautiful piece of furniture. Delieverede assembled!!! Good customer service! Lovely and well built piece of furniture, looks great in our bedroom. Really well protected for delivery too. Will be buying matching bedside cabinets. Absolutely delighted with our 3 pieces of furniture we ordered from you. Very well made and the colour was same as on website. The drawers run smoothly and the knobs suit the items. Delivery was on time and very friendly drivers took our furniture straight into our house. Would have no hesitation in recommending your company to family and friends. A big thank you for your efficient service. Bought this long chest of drawers to replace my small antique pine one. I am loving the cream effect and it's just the right size to place my bits and bobs on top. Granted, the drawers are not that big, but just right for me. It was delivered assembled so we had to take out the drawers to carry up the stairs, but it was relatively easy. Very attractive, solid piece of furniture - looks great and well made. Drawers are fairly shallow and not as deep as my previous old pine chest so have had to cull some of my tops! This piece is very heavy - 76kg and getting it upstairs seemed an impossibility until we removed all packaging so we could get a grip on it and the drawers (which necessitated removing the little 'dowels' which prevent the drawers from coming right out. Excellent value for money (at the reduced price) compared to High Street furniture shops. Very good quality item of furniture. 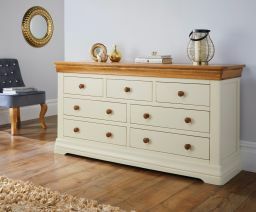 We are very pleased with our country style chest of drawers.Also the draws open and close with ease. And it looks great in our bedroom would recommend to anyone also the price including delivery is very good..
Really love this, the items are stylish and are well made. They came extremely well wrapped and not having to assemble anything was excellent. We felt that the items were vey well priced and not that much more than some very inferior flat packed rivals. We bought the chest of drawers with a matching mirror to sit on top and a bedside cabinet and they have helped make the bedroom look lovely and modern. I am thrilled with the quality. The delivery was on time and it looks fabulous in the bedroom. Thank you. Not yet in place but I already have one of these chests and was so pleased that I have just bought another identical one to go with it. Nuff said? Good looking piece of furniture. Couldn't work out how to remove the drawers at first but a quick phone call to Top Furniture revealed that you needed to remove the small dowels either side of the drawers before they would come out. Easy to put back together again, once you know how. Very pleased with these stylish drawers. Good value for money and delivered on time. Lovely piece of furniture looks stunning and very eye catching. Great value for money compared with other furniture we have bought. Came ready built and well packed. Very solid. Would buy from this company again . The build quality of these units is extremely good. The look and design, I believe, is exquisite and would enhance any traditional or modern bedroom. There are cheaper units on the market but these units are on a different quality level which will also last the test of time. Very happy with the quality of these items. Standard of workmanship is very good and the value for money easily exceeds equivalent items in furniture stores. The drawers are a tad shallow but this is nit picking. There were no delivery issues. The items were delivered on time as promised. The furniture was well packed and protected too. Would always recommend this company and its products. I'm very pleased with my Farmhouse Country chest on drawers.